Food memories are often “as best as we remember it” because the emotions around them can cloud or enhance what we remember. For example, when I was pregnant with my second child, I simply could not eat iceberg lettuce. It made me so sick that to this day I cannot eat it. What’s interesting is that when I think about iceberg lettuce now, I don’t seem to have memories of eating it ever, though my parents will tell you that I most definitely did, and for a time, wouldn’t eat any other type of lettuce as a child. Another example is a friend whose mother always made cake from a box for his birthday which was the only time his mother ever baked, so in his memory, his mother made the best cakes ever. As a grown up, after eating one of my homemade cakes, his mother made him a cake from a box, and he couldn’t believe the difference in taste because he was sure his mother’s cake would win the “best ever” taste test over my homemade cake, which he had to admit, it didn’t. This week I received an email from someone whose grandmother used to make a lemon bundt cake that held fond memories for her. She wanted to be make the cake for her granddaughter but realized that with all her granddaughter’s food allergies she couldn’t. So, she asked if I might help her find a way to recreate the cake so that it tasted and looked just like her own grandmother’s recipe. Her grandmother’s recipe called for 3 cups of all purpose flour, 1 cup of butter, 2 1/2 cups of sugar, 6 eggs, and 1 cup of sour cream in addition to the salt, baking soda and lemon juice. When I read the recipe, I realized that in addition to the allergy substitutions, the cake needed a health-makeover as well! 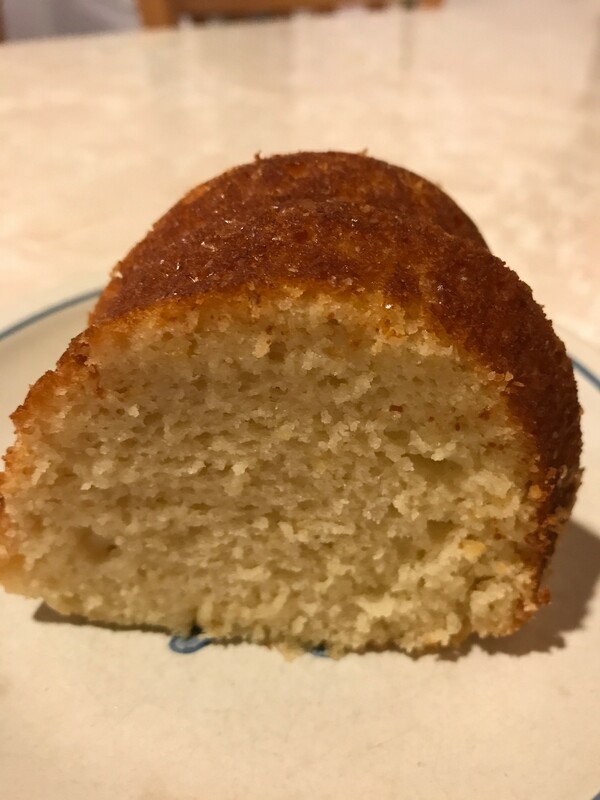 The Flour: Since the granddaughter needed to be gluten free I opted to use King Arthur’s gluten free blend, but to make the cake a bit healthier, I chose the whole grain blend instead of the straight rice flour blend and reduced the flour to 2 1/2 cups. The butter: The granddaughter’s dairy allergy meant substituting the butter with something else, but to make it healthier as well, I decided to use olive oil which has good fats and to reduce the amount to 2/3 of a cup. Because I didn’t want a heavy olive oil flavor, I used the extra light version. The sugar: 2 1/2 cups of sugar is a lot! My friend didn’t ask me to do anything about the sugar, but I couldn’t help myself. I opted to use a combination of agave and truvia. To create the exact same sweetness as the original cake, I used 2/3 cup agave with 1/2 cup truvia. To make the came so I’d like it, which meant it being much less sweet, I reduced both amounts by half. So, folks can choose what they’d prefer. The eggs: Six eggs is a lot! I reduced the amount by half and added some water to help fill out the liquid ingredients. Since I was using the agave which is a liquid, between the agave and the added water, the reduction in eggs was fine. The sour cream: Since the granddaughter had a dairy allergy, I couldn’t use the sour cream, so I opted to make a buttermilk from soy milk and lemon juice but I reduced the amount to 1/2 since it was a liquid as opposed to the solid sour cream, which reduced the amount of fat in the cake. The flavoring and leavening: I added baking powder to the baking soda since it was a gluten free cake and I used fresh lemons to achieve the most lemony taste by grating the peel and then squeezing the juice. The cake came out amazing! When I served it to company, which included my friend, she said it tasted just like her grandmother’s. So, now she had her grandmother’s cake to serve only allergy friendly and as a much healthier version! 2. Mix the flour with baking powder, baking soda, and salt. Add the lemon peel and mix well. Set aside. 3. Mix oil, Agave, Truvia, buttermilk, eggs, lemon juice and water. 4. Mix the dry ingredients into the wet ingredients. Combine well until the dry ingredients are completely moistened. Batter will be thick. 5. Evenly spread batter into bundt pan and bake for 35-40 minutes until a toothpick inserted into the cake comes out clean. 6. Cool on wire rack for at least 15 minutes before removing from the pan and cooling completely.